At the Etihad Stadium in Melbourne, the stage was set for the derby as the Melbourne Renegades and Melbourne Stars locked horns in a crucial encounter. The Stars couldn’t afford to slip up as they were tottering way down at number seven in the league table. They didn’t do any harm to their campaign, though, as they scampered their way to a hefty win by 46 runs. After losing the toss, the Stars were sent in to bat and it panned out to be a blessing in disguise for the Men in Green. Aided by scintillating displays of power-hitting by Kevin Pietersen, Rob Quiney and David Hussey, the Stars piled on runs at will and set the Renegades a target of 201. 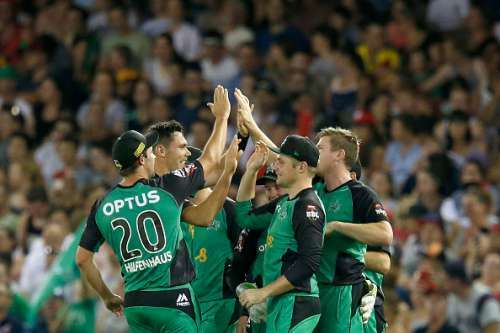 Aaron Finch’s flurry of boundaries spurred hopes for the Renegades, but spinners and some efficient out-fielding sealed the game for the Stars. We take a look at five intriguing moments from the contest. 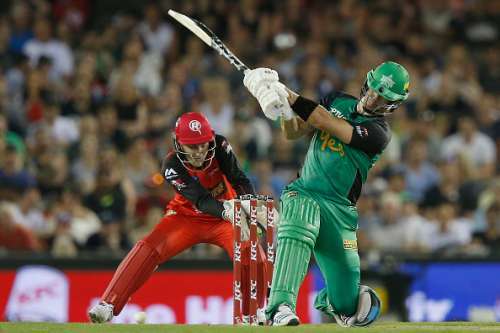 The Melbourne Stars crept along in the initial couple of overs to add ten runs but they lost the wicket of Luke Wright. In his previous four overs during the power-plays, Tom Cooper had tied the batsmen down and it wasn’t any different this time around. Nevertheless, it required a moment of inspiration for the Stars to set things rolling. Kevin Pietersen took the attack to Cooper and swept him for a six over square leg off his very first ball, which was succeeded by another maximum, this time by Rob Quiney. The over fetched nineteen runs and it changed the complexion of the game as the Stars muscled their way to 58/1 at the end of six overs. Sunil Narine had gone for two boundaries in the previous 16 overs he bowled in the tournament but even he wasn’t spared as Quiney creamed a couple of boundaries off him.